Remember me... from Costa Sands Resort.. you did caricature for us last June. Today, i have a special request from you. I would like the caricature to be drawn in the modern western concept. The bride in white gown and the groom in the black and white suit. The background i would like it to be on a full bed of bright red roses and beautiful sky. 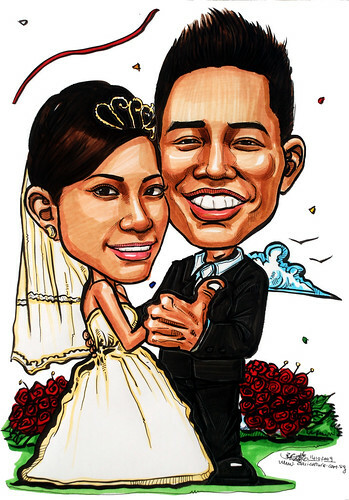 Romantic feel... "
This wedding caricatures turned out quite good to me. Their features ain't hard to capture, despite the groom's photo was quie out of focus.